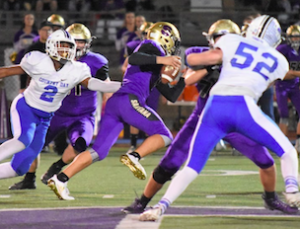 SANTEE – After breaking his collarbone in a Week 2 win over Serra, Santana quarterback Nathan Temple feared his junior season was over. 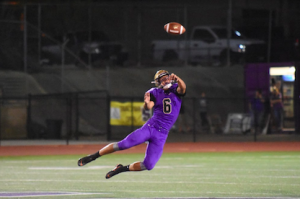 He wound up missing seven games, returned last week in a win over El Cajon Valley and then had a season’s worth of stats in the first round of the San Diego Section Division IV playoffs on Friday night. 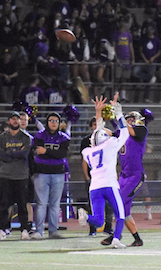 Temple threw for school records of 532 yards and seven touchdowns – five of them going to Randy Smith, who set school records for 13 receptions and 335 yards – as the Sultans outpointed La Jolla Country Day, 76-55, in the highest scoring game in San Diego Section history. Santana had 764 total yards and LJCD 623 for a combined 1,387 total yards, which is believed to be a section record. Santana’s 76 points is the most ever scored by a Grossmont Conference squad. One odd part of Santana’s ledger was the No. 5-seed Sultans (6-5) were averaging only 21 points per game. They were shut out once, scored only one touchdown in three other losses and only two in a fifth loss. Estes also believes that No. 12-seed LJCD (2-8) is a much better team than its record indicates. 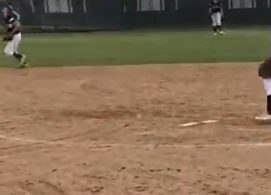 With the huge win, Santana earned a trip to Imperial Beach where the Sultans will take on No. 4-seed Mar Vista (7-3). The Mariners beat Santana, 27-13, on Sept. 21 at Santana. This quarterfinal matchup will be a rare opportunity for the Sultans to play on real grass, which is a concern for Estes and his Sultans, who almost always play on synthetic turf fields. Nothing could slow down Santana against the Torreys. 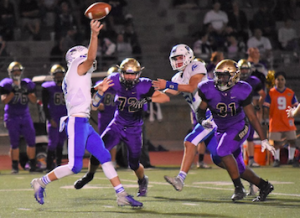 Their 131 combined points broke a section record of 119 set by Rancho Bernardo in a 71-48 win over West Hills in the first round of the 1999 Division I playoffs. 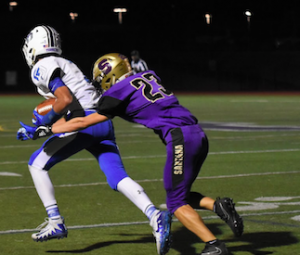 Rancho Bernardo also had 784 total yards in that game, the section record that Santana came close to Friday. Last year, Monte Vista also scored a 71-48 win over San Diego in the Division IV championship game. 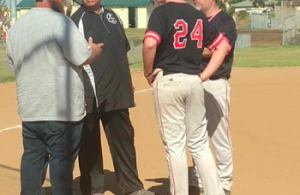 Incidentally, Ron Hamamato was the coach for both Rancho Bernardo in 1999 and Monte Vista last year. The combined 1,387 total yards is believed to be a section record. Oceanside (739) and San Marcos (633) combined for 1,372 in San Marcos’ 49-42 win in Week 3 this season. Santana set or tied 14 school records. DJ Busch threw for 517 yards in a 1999 win over Patrick Henry. Busch had six TD passes in a win over El Capitan in 1999. Temple now owns those. Temple also rushed for 30 yards and a TD so he had 562 total yards, breaking the old school mark of 547 set by Collin Taylor against Grossmont in 2006. 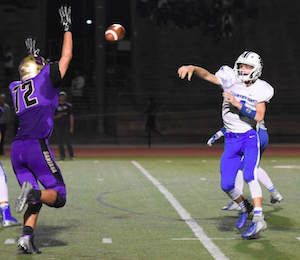 The old school record for team total yards was 591 against Mount Miguel in 2015, and the old mark for points was 70 in a 2011 70-0 win over Grand Prairie of Alberta, Canada. Chris Mazzi had the old record for receiving yards with 274 against Patrick Henry in 1999. Smith owns that now and tied the reception mark of 13 set by Michael Bass against University City in 1998. No section record is kept for points in a quarter, but Santana had 28 and LJCD 27 in the fourth quarter on Friday. Some other oddities: Santana had 18 penalties for 180 yards, and had one TD called back on a penalty. The Sultans lost two fumbles and punted once. The game took 3½ hours to complete. 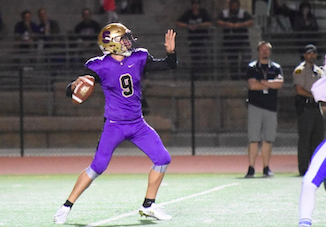 Santana kicker Colton Snipes attempted two onside kicks, and he recovered both of them – which likely would be a section record, but no records are kept on that. Santana won every quarter: 13-0 in the first; 22-21 in the second; 13-7 in the third; and 28-27 in the fourth. In the Sultans’ five losses this season, they scored 7, 13, 14, 11 and 0 points. Chaz Baker also had a big night with four receptions for 103 yards, including a 59-yard TD. Jared Forster caught three passes for 17 yards, including a 5-yard TD. Smith’s TDs covered 4, 84, 10, 10 and 62 yards. Brooks Moutaw rushed 23 times for 148 yards and two TDs as the Sultans had 232 rushing yards. Temple also had a rushing TD as did Ian Litten. “We ran the ball pretty well in the second half,” Estes said. “The offensive guys were happy after the game. The defensive guys, not so much. Santana took a 13-0 lead into the second quarter, but midway through the second quarter, the Torreys had a 14-13 lead. Santana’s biggest lead was 55-28 after the first play of the fourth quarter. But 2½ minutes later, the Torreys had closed the gap to 55-41. Naturally, Country Day had some big stars as well. Sophomore Phillip Gooding threw for 251 yards on 19-of-37 passing with three touchdowns and one interception. Gooding had to leave the game, however, midway through the third quarter. Sincere Blackmon replaced Gooding and even topped his stats in only 1½ quarters. He completed 15-of-24 passes for 258 yards and four touchdowns with one interception. Blackmon, a senior, had attempted only one pass all season until Friday. On the receiving end, Nicholas Albert grabbed 13 passes for 288 yards and fourth-quarter TDs of 90, 10 and 34 yards. Daniel Rosenberg had 9 catches for 130 yards and 2 TDs, and Brandon Kim added 9 grabs for 54 yards and 2 scores. Just two years ago, Santana was in the Division IV title game against the Torreys, who claimed a 38-24 victory. 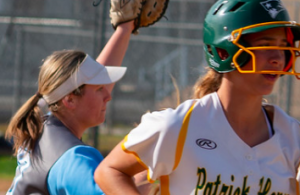 The offensive explosion on Friday night combined with the return of a near-healthy lineup for the first time since early September gives the Sultans immediate hopes for a deep playoff run. Mar Vista is a familiar opponent, and the Mariners have played on even terms with Santana over the recent series.